Chief...what can one say except best ever in Australia? 2014 2015 20162017! FOUR time Australian National Championship trial winner. Rarely not achieving 1st or placing in every retrieving trial.!!! Litter sibling to 2013 Australian National Retrieving Trial Champion Adderslot Carbo. Chief has completed her breeding duties having produced two outstanding talented litters for our kennel. 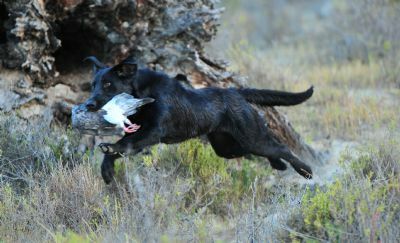 RUSSELL WHITECHURCH trains and competes so successfully with Chief four TIME AUSTRALIAN NATIONAL RETRIEVING TRIAL CHAMPION. Thankyou Russell for once again choosing an Adderslot puppy and allowing our kennel to retain breeding rights.